The problem most people face with digital photography is that the images tend to pile up after a while, and presents a hassle if not managed properly. Ever tried sifting through an unsorted collection for that one photo of your favorite niece doing a handstand? Or try putting a collage together of a particular friend? I’ve found that the best approach is to post-process, caption, categorize and archive your images as part of your workflow, and not let your images pile up and get out of hand. It makes it not only easier to search for a particular photo, but also makes browsing through your collection more enjoyable. Naturally, many software companies are trying to address this need in image archive management and post-processing workflow – Adobe Photoshop Album (now Elements 3), JASC Paint Shop Pro Album, Picasa to name a few. StudioLine Photo 2.5 from H&M Software is another such product, supporting a rather elaborate feature list, and claiming to be an “easy-to-use solution for managing and editing digital image collections – from photo enthusiasts to professionals.” We take an in-depth look at the product in this review. StudioLine Photo installs quite painlessly. On initial startup, a menu is presented with an option for a quick tour or viewing tutorials. Past that screen, another welcome dialog box invites the user to add images, edit, slide show, create a web gallery, email or print. Since our image collection is currently empty, I opt to “Browse and Load” images into our image archive first, which brings up a file browser dialog box. I was a bit confused as to how to actually load a whole directory of images. However, thanks to the popup help box, I discovered that actually dragging the folder (or a group of images for that matter) on to the workspace would achieve my needs. With that done, I found the program actually very slow in performing the initial load of images. It took about 3 minutes to load a directory of about 200 images. I actually made the mistake of attempting to import my collection of 3000 images in one go, which made my CPU max out for over an hour. Most of the screen real estate is taken up by the workspace area on the right. The help and image editing tools pop up as free floating windows that can be moved around the screen, resized and/or docked. In fact, most of the pop up windows support this behaviour. Finally, just a brief mention of hotkeys – this application seems to make widespread use of them, which is a plus for keyboard trapeze artists. For example, the image toolbox can be brought up with a CTRL+F combination, and image rotation performed by pressing CTRL+Left or Right. Double clicking on an image loads it into the image viewer window. This window itself can be configured to show a split view, with the original image on one side and the modified image on the other. 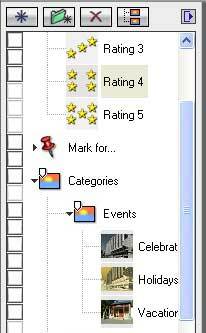 The bottom portion of this window hosts a few tool buttons, including rotation, deletion, zoom and slide show functions. In slide show mode, the interval and order can be configured, and a full screen mode can be activated as well. Descriptors is a fancy name for viewing and manipulating metadata for your images. Most cameras capture and store shooting data (such as zoom setting, aperture and shutter speed) as metadata fields within the image files themselves. 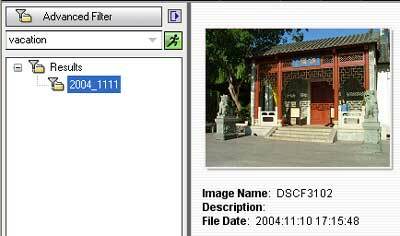 This data can be accessed in StudioLine Photo in two ways – pressing CRTL+D brings up a popup window, or one can access the docked version by clicking on the Descriptors tab on the left hand side of the screen. IPTC/NAA data: another metadata scheme, which can store information such as keywords, captions, copyright info and more. Classifications: the image categorization and classification keywords, which we’ll come to in a second. Adding information to or editing the descriptors is as simple as double clicking on a field and typing away. Effects: colorize, bicolour, black and white, backdrop, soft edge, text, invert image, transparency, emboss and others. Applying a tool or effect to the image is a straightforward matter of selecting the image thumbnail and clicking the tool, or dragging the tool from the palette on to the image. Effects can also be applied to multiple images by selecting more than one thumbnail. When a tool is activated, a popup window with tool options is displayed, allowing tweaking of the settings, which can be seen on screen immediately. 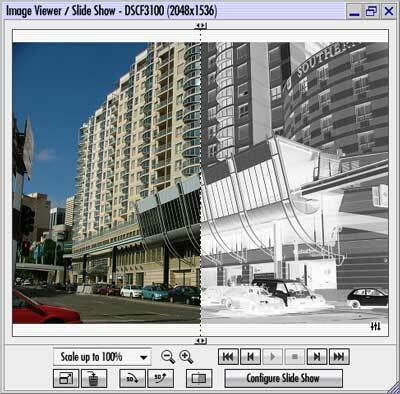 If this is performed in the image viewing window, the split screen window shows the original and post-processed image. Firstly effects are applied to the whole image, and selective editing is not supported. One can’t for example, clone out the intrusive jogger in the background, or blur the background to create the nice portrait look. 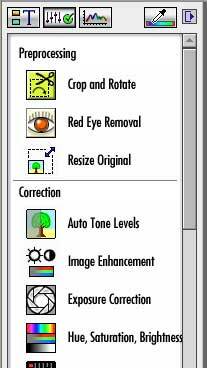 Don’t throw out your image editing application yet, as it’ll be required for more advanced work. Also a brief mention to the way StudioLine Photo stores changes to the images – it appears to record all the parameters selected for images and apply them on the fly. This is great in that the base image is never altered, and you can continue to tweak the parameters of different effects, even revert them completely, until you’re fully satisfied. 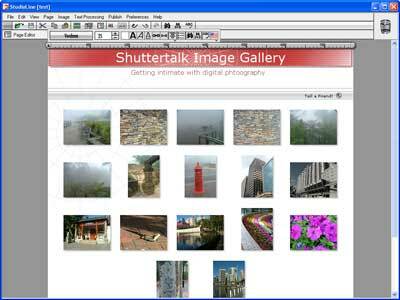 To make an image collection easier to search through later on, StudioLine Photo supports a Classification system, much akin to the tags from Adobe Photoshop Album. This feature is accessed through the Classifications tab on the left, which contains a hierarchical tree view of categories and keywords. Simply clicking and dragging these keywords onto images associates the two together. For example, I could create a category of Places, and a keyword of “Sydney” to classify photos from my trip. Under a People category, I could mark images of my wife, sister-in-law and niece, whom I saw on the same trip. The idea behind this is that a year down the track, I can easily search for “Sydney”, “Wife” and “Cruise” to bring up photos of our enjoyable boat ride in the harbor. Furthermore, StudioLine Photo also supports additional tags – a 5 star rating system, and also a “Mark for…” mechanism for tagging images for emailing, printing, exporting to the web, or burning to CD/DVD. The keywords themselves are embedded into the IPTC metadata (keywords tag) for each image so they can be used in other applications as well. One quirk which I found (which I will put down to reviewing a very early release of StudioLine Photo 2.5) is that the check-boxes to the left of the keywords didn’t line up with the tags. In addition, clicking on the check-boxes was supposed to show all images fitting that particular tag, but didn’t seem to do anything. I sincerely hope they fix this in future releases. The task of finding a particular set of images or browsing through your collection is made easier in StudioLine Photo with a couple of tools. The Timeline tool brings up a month view calendar, which highlights dates in bold for images taken on that day. Clicking on the dates displays thumbnails of those images. While this is handy for viewing specific events – for example if a birthday fell on a particular date – I still think it’s not as intuitive as the linear timeline bar from products such as Photoshop Album. 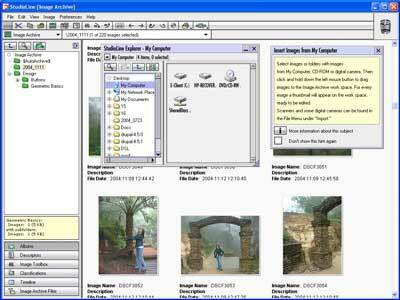 An alternative approach is to perform a search by clicking on the “Image Archive Filter” tab on the left. Typing a particular keyword in the search box and hitting enter will bring up a list of images with matching keywords. An advanced search can be performed as well, allowing users to select multiple criteria and operators (contains, does not contain, is greater than, etc.) to target specific images. This is very powerful indeed, especially if you have categorized your images thoroughly. 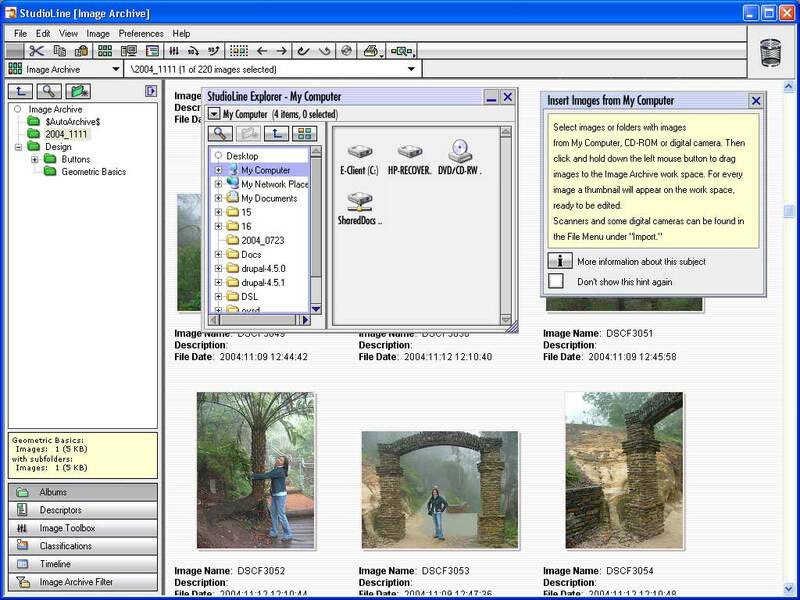 When it comes to sharing images, StudioLine Photo supports emailing images, archiving them to CD or DVD, printing and also creating a web gallery of images. Doing so is a matter of highlighting images from the archive, and clicking on the appropriate button or menu item. The print and web gallery functions appear to be well thought out and quite powerful, so I’d like to explore those further. Clicking on any of those items brings up the particular function in StudioLine Photo, and allows the user to make the necessary adjustments. Once satisfied, a style chooser appears, allowing the user to select from approximately fifteen different web gallery styles. There is also an option to specify the title and tagline, web and email addresses, and whether rollover effects should be applied to thumbnails. Finally, a page editor is displayed, where images can be moved about, and text can be added, modified and formatted in specific areas on the page. 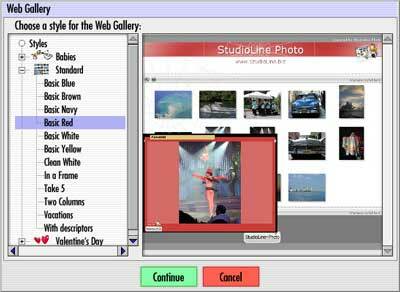 On the printing aspect, StudioLine Photo again has a host of features. 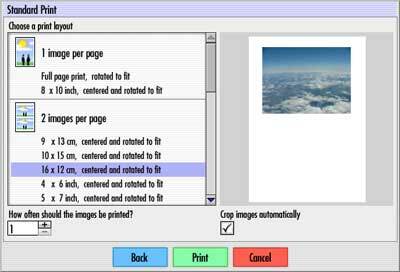 You can opt to perform a standard image print, through which a range of page layouts, size, number of photos can be selected. In addition to this, print projects can also be created. 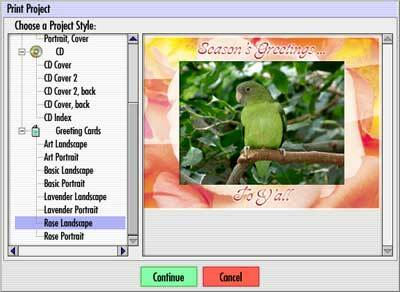 Approximately twenty templates are bundled with the base install of StudioLine Photo, ranging from calendars, CD/DVD covers, to greeting cards. Once a template is selected, a page editor allows custom text to be added, and elements to be moved around the page. 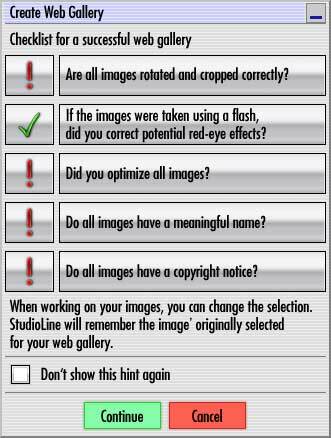 All in all, I found StudioLine Photo to be quite a full featured image management package. 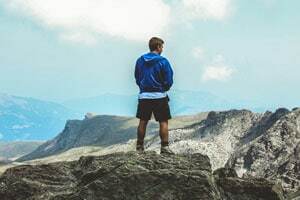 Certain aspects such as cataloging, viewing metadata and searching are quite powerful, which is quite essential in administering an image collection. However, a counter intuitive interface, processor and disk intensiveness detracted a bit from what was a useful, feature packed product. In parting, I believe choosing an image management and archival should be done carefully, as the many hours put in managing, cataloging and tagging images with one product is usually not transferable to another. I would recommend downloading a trial version to see whether it suits your needs in particular, and how the interface sits with you. 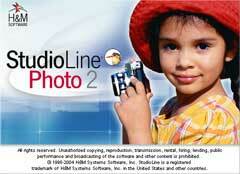 StudioLine Photo 2.5 from H&M Software is available from their website for $44 USD. 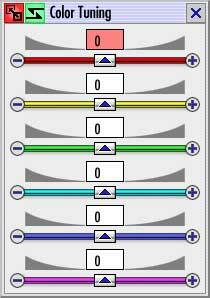 There is also a freeware Basic version, which is based on an older version of the software with fewer features.